Meanwhile, the Irish Cancer Society and Irish Heart Foundation have raised concerns about the origins of the data used in the report. THERE SHOULD BE tougher penalties for ‘black market’ criminals, Fianna Fáil Spokesperson on Justice Niall Collins said today. He made the comments in the wake of a new report from Retail Ireland on the black market. The report said retail crime and black markets are costing the Irish government about €861 million a year. Deputy Collins has accused the Government of having a “casual attitude” towards the country’s black market. The report shows that Ireland has a very active and profitable black market compared to international standards. This means that we are making it far too easy for criminals to rip off Irish tax-payers. He said that the current level of convictions for selling counterfeit or stolen goods is simply not enough of a deterrent. Collins added that he believed criminals “must begin to feel the strong arm of the law”. At the moment, the average fine imposed for cigarette smuggling [is] €1,600, even though the maximum penalty allowable is €127,000. A zero-tolerance policy in this area would allow the courts to impose the toughest possible penalties, thereby deterring small time criminals from selling illegal cigarettes for quick and easy money. Meanwhile, the Irish Cancer Society and the Irish Heart Foundation said that “questions need to be asked about the origins of the data used in the report”. They said that while they welcome Retail Ireland’s call for more resources to be allocated to law enforcement agencies to reduce the availability of illegal tobacco in Ireland, they are calling on Retail Ireland / IBEC to “use credible figures in its reports” and “avoid sensationalising” the subject matter. 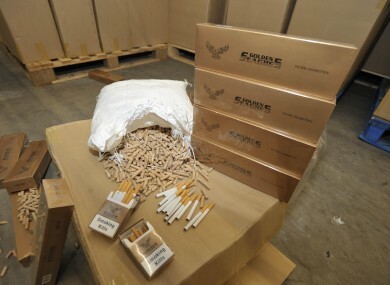 The Revenue Commissioners and the Department of Finance have found that 14 per cent of cigarettes smoked in Ireland are smuggled into the country. This is an unacceptable level but it is 10 per cent lower than the rate claimed by tobacco industry sources in Retail Ireland’s report. The difference in figures is because Retail Ireland is using data collected by the tobacco industry which has a clear conflict of interest in supplying data of this kind. She claimed that the tobacco industry “is keen to overstate the rate of smuggling as a high level of illicit trade is used in arguments to reduce the price of tobacco in Ireland”. This argument is completely disingenuous given that it’s the tobacco industry that raises the price of cigarettes every year, regardless of whether Government does or doesn’t. The Irish Cancer Society and the Irish Heart Foundation called on the government to reject calls not to increase the price of cigarettes in Budget 2013. Ireland’s anti-smoking charities also challenged the claim in Retail Ireland’s report that smoking smuggled cigarettes is more dangerous than smoking legal cigarettes. Chris Macey, Head of Advocacy at the Irish Heart Foundation, commented that “to say that they are somehow a ‘safer’ option is ludicrous”. Email “Call for tougher penalties for 'black market' criminals”. Feedback on “Call for tougher penalties for 'black market' criminals”.